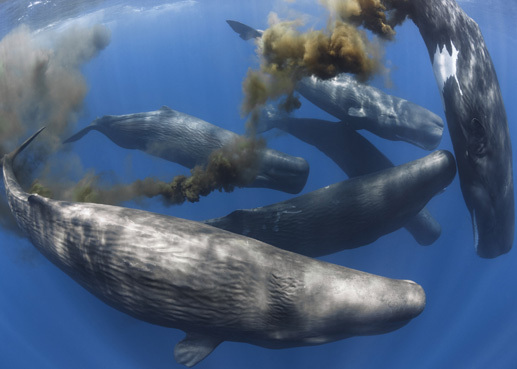 Whale Poo Can Help Reverse the Effect of Climate Change. Since the International Whaling Commission (IWC) banned commercial whaling back in 1986, whale populations have increased significantly across our world’s oceans and certain species that once teetered on the brink of extinction have made a remarkable comeback. It is considered by some as one of the most remarkable conservation success stories of our time. Unfortunately, all these years later, ocean advocates are still fighting to save vulnerable whale populations from being slaughtered at the hands of certain nations that continue to support commercial whaling. But while environmentalists continue their mission to save the whales, research has actually shown that they could be the ones that end up saving us – with their vast plumes of poo! A study undertaken several years ago by the University of Vermont showed that whales have a huge impact on the healthy functioning of the oceans (and thus the planet as a whole), particularly when it comes to carbon sequestration. Conservation biologist Joe Roman, who took part in the study, believes that the massive decline of whale numbers due to commercial whaling “very likely altered the structure and function of the oceans”. You may be wondering how it could be possible that whale excrement could hold the key to a healthy ocean and in turn a healthy planet? It is another superb example that everything in our natural world is connected. But how does it all work? 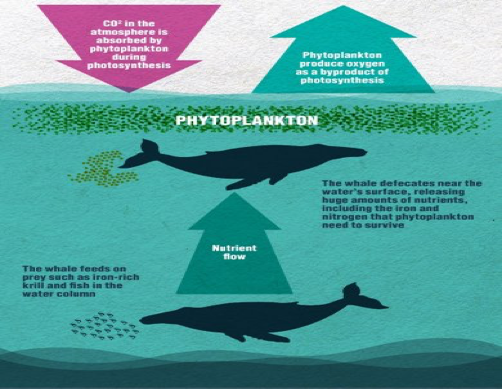 Whale poop serves as a nutritional powerhouse for phytoplankton. It is particularly rich in iron and nitrogen, two key minerals necessary for phytoplankton growth. So essentially what is happening is that whales are fertilising the plankton – which is a primary food source for countless animals in the sea. It is all a perfect cycle. More whales = more whale poo = more plankton blooms = more fish. But that’s not the only vital role played by phytoplankton blooms. Besides feeding countless organisms in the sea, it is also responsible for removing large amounts of CO2 from the atmosphere during photosynthesis, and of course, produces oxygen as a byproduct. Zooplankton, such as krill, then feeds on the phytoplankton and when the zooplankton die, they sink into the dark ocean depths, taking their stored carbon out of circulation. Phytoplankton thus forms the basis of the ocean’s ability to absorb greenhouse gases and store them away permanently. Researchers believe that when whale populations were at their peak, (before we started decimating them in large numbers), they were directly linked to the removal of millions of tons of carbon dioxide from the atmosphere each year. With this knowledge in mind, the continued fight for the survival of our great whales could not be more urgent. A burgeoning population of our leviathan beauties along with their priceless poo, could help offset a little bit of the damage we have done to our planet. It would be foolish to hope that whales alone can save us, but a robust worldwide population of these incredible “ecosystem engineers”, could help offset or slow down the catastrophic effects of global warming. We say three cheers to whale poo!